Brigadier General Steven Hummer carries a handful of experience and knowledge under his belt. His more than three decades in the Marine Corps has brought him to work in different divisions within the Marines, and fairly recently, as a commanding officer of the 1stMARDIV in Operation Iraqi Freedom I.
Brigadier General Hummer has received more than a dozen commendations for his enduring participation in the military. And of all the awards and medals he holds, it is the Military Outstanding Volunteer Service Medal that he considers most important—a proof to the military’s commitment in serving not only the nation, but also the local community and its people. “I think our country has really shown themselves as being a giving country,” he adds. 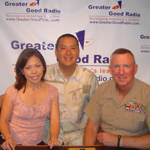 Greater Good Radio proudly brings Brigadier General Steven Hummer of the Marine Corps Base Hawaii as he shares with us the importance of mentorship in one’s growth and development, and an effective way of setting and meeting professional and personal goals. Brigadier General Steven A. Hummer assumed his current assignment as the Commanding General, Marine Corps Base Hawaii, on 9 September 2005. He enlisted in the Marine Corps in 1970 and was discharged as a Sergeant in 1973. He was commissioned following graduation from Albright College, Reading, PA.
As a company grade officer, he served in the operating forces with 3d Battalion, 3d Marines and 1st Battalion, 9th Marines. His assignments included Rifle Platoon Commander, Battalion Training Officer, Battalion Operations Officer, and Company Commander. As a field grade officer, he served in the operating forces with 1st Marine Division (1stMARDIV), I Marine Expeditionary Force (MEF), and III MEF. His assignments included Officer-In-Charge, 1st Marines Regimental Enhanced Training Section, 1st MARDIV; Operations Officer, 31st Marine Expeditionary Unit (MEU) (Special Operations Capable (SOC)), III MEF; Officer-In-Charge, Special Operations Training Group, III MEF; Assistant Future Plans Officer, 1st MARDIV; Commanding Officer, Battalion Landing Team 1/1 under 13th MEU (SOC) and 15th MEU (SOC); and Commanding Officer, 7th Marines, 1stMARDIV, during combat operations in Operation Iraqi Freedom I. Supporting establishment duties include Registrar, Marine Corps Institute; Ceremonial Rifle Company Commander, Marine Barracks, Washington, D.C; Department Head, Naval Expeditionary Warfare Training, Expeditionary Warfare Training Group Pacific; and Chief of Staff, Joint Special Operations Command, with participation in Operation Iraqi Freedom and Operation Enduring Freedom. Professional military education includes The Basic School, Officers Infantry Course, Amphibious Warfare School, Command and Staff College, and School of Advanced Warfighting within the Marine Corps University; and the Air War College. Civilian education includes a Bachelor of Science degree in Psycho-Biology from Albright College and a Master’s Degree in International Security Studies from the Air War College. Personal decorations include the Defense Superior Service Medal, Bronze Star, Legion of Merit with Combat V and two gold stars in lieu of third award, Meritorious Service Medal with two gold stars in lieu of third award, Joint Service Commendation Medal, Navy and Marine Corps Commendation Medal with gold star in lieu of second award, Navy and Marine Corps Achievement Medal with gold star in lieu of second award, Combat Action Ribbon, Presidential Unit Citation, Military Outstanding Volunteer Service Medal, and various other personal and unit awards.